What happens in the first full month of life can make or break a show guppy. Whether you are hoping to raise winning show fish or just super special guppy pets, what you do in the first 30 days will make all the difference. Even though guppy breeders have many diverse methods of handling this critical period, it is generally agreed that it is important to make the most of this period of rapid growth and development. To get really good size and bodies sturdy enough to support the developing large finnage you have to push guppy fry to the maximum during the short interval between birth and the beginnings of sexual development. Guppy development tends to follow a certain pattern. During the first month of a guppy’s energy intake goes toward body growth and the development of muscle and bone structure. Towards the end of the first month the guppy begins to divert even more energy into sexual development. By about the sixth week the guppy begins to divert even more energy into sexual activity. At this time energy is also beginning to be channeled into finnage growth… first of the caudal and, a month or so later, into dorsal growth. Even though the guppy will continue to put on body growth even up to death, the body growth becomes slower and slower. Obviously, for maximum size in their fish, guppy breeders concentrate on the first month of almost exclusive growth to get their show guppies to the best possible size before the energy starts to divert in other directions. But let’s get back to the brood fish we set up in the last article (October FAMA). If you followed along and set up your breeders, by now your highly pregnant females should be isolated in their own ‘nursery tanks’ and be very near to dropping fry, if they have not already done so. There should be some protection for the fry such as clumps of foxtail or an unraveled plastic “chore girl” pad. (Guppies simply do not grow well once they get into mama’s digestive tracts!) As soon as possible, after she finishes dropping, the female should be removed. Top breeders keep careful track of which female mothered which batch so that if a batch produces a number of really good show fish they can go back to the same female for future litters, or know which female to dispose of if the batch proves rather lean on show quality fish. For this same reason the female is kept away from all males to insure that subsequent litters will be on the same mating. With mother gone, the fry now have the run of the tank and all the food that it is provided with. The purpose of the small 5 gallon tank during the first month is that fry will grow better when they don’t need to use up much energy looking for food… the energy goes toward growth instead. Bare tanks with corner filters make it possible to closely monitor the feeding so that the fry always have food before them, yet any food not eaten can readily be siphoned off the bare bottom before it has a chance to spoil. Breeders often use snails or other scavengers in fry tanks so that any leftovers from force feeding are cleaned up, especially uneaten live brine shrimp that decay rapidly once they have perished in the fresh water. Feeding … How Much? How Often? What to Feed and How? Force feeding was mentioned earlier. The trick to force feeding guppies is to get the fish to keep eating a little more than they might naturally be hungry for… and to eat a diet that supplies them with all the essentials they need for growth. This means high quality food with a minimum of unusable filler material that takes up space in their turnroles but passes through without benefiting the fish. Just like a child that won’t turn down an ice cream cone even though already uncomfortably full from a large dinner, guppies will excitedly gorge when a new favorite food is fed, even if they are really not all that hungry. This, of course, implies a certain order in presenting foods. The full feeding of the day is the one to present a food you know is good for them but about which they are not particularly enthusiastic… they will keep eating it because they are truly hungry. While their bellies are full and feeding has become less enthusiastic, add a feeding of live baby brine shrimp and watch the sheer gluttony with which they attack it… as if they hadn’t eaten in weeks. That is what force feeding is all about… keeping the irresistible goodies coming so they keep eating whether hungry or not! Any good stick to the ribs dry food to last through the night. If this is the last feeding, allow at least an hour for the fish to clean it up before lights out. 9 & 10. If you can handle the extra two feedings, repeat any of the above. Because brine shrimp have a laxative effect, most breeders precede all feedings of live baby brine shrimp with a feeding of solid food to work as a kind of stopper to keep the brine shrimp in the digestive tract long enough that the fish can get maximum nutritional benefit from them. The next feeding after a brine shrimp feeding, the fish are ready again for another stick to the ribs kind of food. By alternating foods and flavors the fish are tempted to maximum indulgence and, at the same time, are sure to be getting the best possible assortment of essential nutrients, since no single food has everything. I might mention here that it is next to impossible to get maximum growth from fry without the use of some kind of live food, especially during the first crucial formative months. Although baby brine shrimp (newly hatched) are almost universally used by major guppy breeders, guppies also enjoy live tubifex worms (although many breeders feel the risks of contamination are too great), mosquito larvae, white worms, vinegar eels, tiny gammarus, micro worms, wingless fruit flies, etc. Guppy breeders have found that frequent water changes seem to spur growth. With so many fish in a small volume of water eating so heartily and so continually, frequent water changes are necessary to remove waste material and ammonia. Trace elements are also replaced, and the water changes seem to be invigorating and an appetite stimulant to the fry. Some breeders replace 25% of the water once a week while others prefer to change lesser amounts (such as 10%) daily. Changing more than 25% at any one time could shock the fish if the water quality or temperature were very different than that in the tank. In Singapore commercial breeders change up to 100% of the water daily and produce very large fish… but they are blessed with water that is naturally warm and not chemically treated. Temperature also affects growth… the warmer the temperature the more the metabolism of the fish is stepped up. Breeders take advantage of this fact in different ways. Some breeders keep their fry quite warm (80 degrees) so that their fish will eat more and ~row faster even though they know that the fish will “bum out’ faster later. The other school of thought is that by keeping temperatures low (72 degrees) the fish will mature more slowly thus giving a longer period of time during which energy is used primarily for growth. Still others try to hit a happy medium keeping their fish around 75-76 degrees. Since all methods have produced top show fish, irs what works best for you during the growing stages. When guppies reach maturity, most breeders try to keep them in cooler tanks so they remain in their prime longer. Lighting also affects growth. The number of hours the lights are on influences the number of hours the fish are actively feeding. Some even leave the lights on 24 hours a day. Others feel that unless fish can be fed every two hours throughout this 24 hour period, the extra activity without extra feeding siphons energy from growth. Probably the most common lighting schedule used by top breeders is 16 to 17 hours on, 7 to 8 hours off. The intensity of light does not seem to be a great factor in growth, but too little light, or light that is too dim, has been shown to cause deformities, especially of the spine. I won’t go into filters here because many kinds are used successfully, the main criterion being that they are kept clean. Undergravel filters are seldom used by guppy breeders who are force feeding because of the difficulty of siphoning off uneaten foods. Probably the most common filter used in guppy breeding is the inside box filter with charcoal and dacron wool. I know it is the only filter I have found that keeps the water crystal clear and unyellowed. I presume many outside filters would do as well, but since most guppy breeders have many tanks placed tightly side by side, there is no place but the front glass to install them and that is not particularly desirable. Culling begins with day one. A breeder whose goal is a tank of prime show fish keeps a continual close watch for any inferior fish. In batches of newborn guppies there are often one or more that are darker color than the rest and may not swim well. Almost never will such fish develop properly and they should be removed as soon as spotted. Belly sliders might be of normal color but sort of slide from one spot to another rather than swimming. These rarely develop properly and should be quickly disposed of. As the fiah begin to grow, there are usually a few that are considerably behind the others in size. Seldom do they turn out to be large bodied adults so can also be discarded. However, if there are fish that keep up in size with the majority but lag behind in the onset of sexual development, do NOT dispose of these as they could well become the biggest fish of all because they are still turning the majority of their energy into growth while the others are diverting energy into sexual development. To recap, the main job during the first month of raising a show guppy is to push growth through force feeding of quality foods, water changes, cleanliness and controlled temperatures. During this period the fry do best in small tanks where they never have to go far for food. The culling of inferior fish is a continual process so that more food and tank space is available for growing the real show stoppers. By next month the fry will be about ready to move to larger headquarters and we will get into sexing and watching for key signs of development. 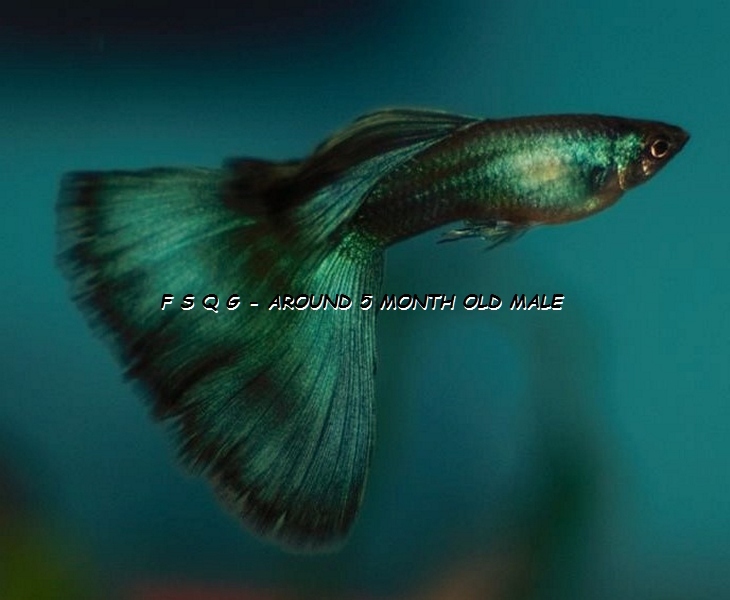 This entry was posted in Guppies - breeding, Guppy Blog - Guppies corner and tagged FRY, Guppies - breeding, Guppy Breeding, THE VITAL 1ST MONTH / BY MIDGE HILL. Bookmark the permalink.